In general, personal expenses such as a Hawaiian vacation, food, and everyday clothes are not deductible. Most business related expenses are deductible. Expenses for a sole proprietary business are usually deducted on Schedule C. Expense related to the rental of real estate on Schedule E. Investment-type expenses usually go on Schedule A. Where things can get a little murky is when a cost is both business and personal. In this case you can often deduct the portion that is used for business, but not the personal portion. Cars and homes are often prime territory here. For example, let’s say you work from home. If it qualifies, you may be able to deduct expenses for your home that you use for business purposes. You can read more about the home business deduction from this article. Many people wonder if day-to-day commuting expenses are deductible. The short answer to that questions is no. However, some transportation expenses are deductible. An example would be the expense of traveling from one workplace to another workplace. Say you work from home and you need to travel to your client’s office. You may deduct the expense going to and from your client’s office. Also, if you were to work at a temporary work location, you may deduct that traveling cost. You can deduct most medical expenses as an itemized deduction. Doctors, dentists, hospital expenses are usually deductible. However, some medical expenses are not and include: cosmetic surgery, certain controlled substances, teeth whitening, toiletries, health club dues, and funeral/burial services. In addition, the medical deduction is only beneficial to the extent the total amount exceeds 10% of your adjusted gross income. Which simply means that many people will not actually benefit from their medical expenses. Note that you cannot deduct both state sales and state income taxes—it’s a one of the other scenario. Federal income taxes, social security taxes, and estate and inheritance taxes are also non-deductible. Most contributions to a legitimate charity are deductible. But, charitable or gift-type payments directly to individuals are not. To deduct contributions, you need documentation showing the qualified organization name, date, and amount of contribution. For any contributions of $250 or more, you need a written acknowledgement stating whether or not the organization provided any goods or services in exchange for your contribution; and, if so, a brief description and its estimated value. Finally, under certain circumstances you may also be able to deduct the fair market value of property you donate to an organization. There you have it. 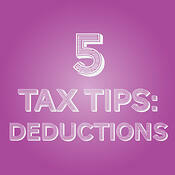 With that in mind, go for those deductions that apply to you and minimize your taxes. If you have any questions, please comment below or contact us. We are always happy to help. 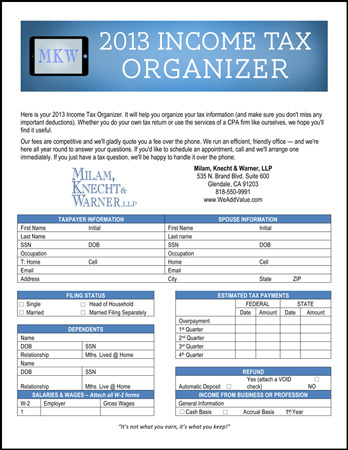 Also, if you haven’t already started organizing your tax documents, click below to get a fee income tax organizer. Cheuk Wong is a staff accountant at Milam, Knecht & Warner, LLP. She graduated from USC with a double bachelor’s degree in Accounting and Business Administration – Finance. Ouside of work, Cheuk enjoys playing basketball, piano, reading a good book, and watching funny cat videos on the internet. She loves cats.